Sold by Music & Records (4.5 out of 5 stars | 13 ratings). Sold by New Super Star Selections and ships from Amazon Fulfillment. Eight years have passed since the events of Ek Tha Tiger and the whereabouts of Tiger and Zoya are not known. In Ikrit, Syria, 40 nurses – 25 Indian and 15 Pakistani – are held hostage in their own hospital by Abu Usman, the head of ISC, a terrorist organisation. The chairman of the Research and Analysis Wing (RAW), Shenoy, feels that only Tiger would be able to rescue the nurses and that too within a period of 7 days as the United States will launch an airstrike within 7 days to kill Usman. Presently, Tiger and Zoya live in Innsbruck, Austria and have a son, Junior. Shenoy and his deputy, Karan manage to find Tiger and requests him to undertake the mission. Although hesitant at first, Tiger agrees after Zoya asks him to carry out the mission for his country. Tiger and three other RAW agents Azaan, Namit and Rakesh travel to Syria. 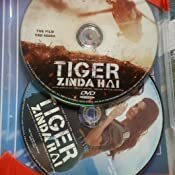 Meanwhile, Zoya comes to know of the Pakistani nurses held hostage along with the Indians and joins Tiger with two other ISI members Abrar and Javed. On the day of the airstrike, Tiger managed to rescue the nurses from the hospital. Meanwhile, Abu Usman holds Zoya hostage and captures Tiger, who is put into a poison chamber. Tiger, Zoya and the nurses flee after Tiger defeats Abu Usman and his troops. 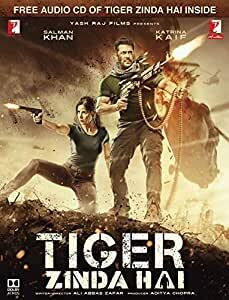 Tiger and Zoya go into hiding once again due to Tiger's belief that the RAW will never forgive him for deserting them, but tells Shenoy he will always be there if his country is in trouble. 5 star for the Audio CD and Dil Diya gallan song. Bought this only to listen dil Diya song in 2 channel stereo through Audio CD. 5.1 remix of the dil Diya gallan song is top class. The movie should have been of 100 minutes instead of 160 minutes. 5.0 out of 5 starsNice movie! Nice movie!! Excellent picture as well as sound quality. Expected some extra features + deleted scenes DVD with Blu-ray as the audio songs are easily available in 320kbps from any of the songs website. if mastered in 5.10 is better for those who are having 5.10 channels.